From Daredevil vol. 1 #172 © 1981 Marvel Comics. ART BY FRANK MILLER AND KLAUS JANSON. Introduced in Stan Lee and John Romita, Sr.'s frequently imitated “Spider-Man No More!” in The Amazing Spider-Man vol. 1 #50 (1967), Marvel Comics' absolute crimelord, the Kingpin, might have been upstaged by that pioneering story's costume- in-the-trash-can scene were it not for Kingpin's matchless ability to fight his way to the top. Taking advantage of Peter Parker's abandonment of his troublesome Spider-Man career, Kingpin initiates “a campaign of crime such as the city as never known,” mobilizing his trusty goons in a hostile takeover of New York's underworld. Parker's retirement is short-lived, and when the jovial webslinger meets his “tubby” opponent in issue #51, he assumes Kingpin to be a pushover until the villain's vise-like grip and surprisingly fast fists wipe the smile from Spidey's masked face. A bald and brutal man-mountain weighing 450 pounds, the exquisitely dressed Kingpin's appearance owes a nod to the dapper character Kasper Gutman, played by actor Sydney Greenstreet in director John Huston's noir classic The Maltese Falcon (1941). Often depicted carrying a diamondtopped cane, which in its earliest appearances emitted laser blasts, Kingpin is a master of all forms of hand-to-hand combat including the sizeappropriate art of sumo wrestling, skills he hones through regular “exercise” sessions with unfortunate underlings. A detested, overweight child, Kingpin at an early age disciplined his massive body and his mind, using his bulk to literally muscle his way out of his impoverished roots and into organized crime as a ganglord, masking his myriad rackets under the veil of legitimate businesses (most notably the import of spices from the Far East). 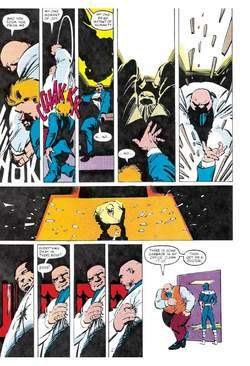 Kingpin was regarded a Spider-Man rogue until Daredevil writer/artist Frank Miller appropriated him, beginning with vol. 1 #170 (1981), the issue in which readers finally discovered Kingpin's real name: Wilton Fisk. Kingpin's illegal enterprises gave purpose to Miller's street-level Daredevil, and their relationship evolved from enmity to obsession. In the mid-1980s Daredevil storyline “Born Again,” Kingpin exposed his foe's weaknesses and left him teetering on the precipice of death. The Man without Fear struck back in “The Fall of the Kingpin” in Daredevil #297–#300 (1991), systematically dismantling Fisk's territory and (temporarily) putting the mastermind out of business. Kingpin's single weakness is his family. When first seen, his wife, Vanessa, an elegant socialite, disapproved of his illegal activities, and upon occasion Kingpin deceived her into believing he had gone straight. During Miller's first Daredevil run Vanessa was thought to have been killed, but she later resurfaced. The Schemer, a caped mob czar introduced in Amazing Spider-Man #83 (1970), was exposed as Fisk's presumed-dead son Richard, anguished over his father's lawlessness and attempting to bring down Kingpin's empire. Various 1980s and 1990s storylines showed the junior Fisk's love/hate relationship with his father. He covertly maneuvered to destroy Kingpin's organization from within as the masked mobster the Rose, then briefly succeeded his father as Kingpin II, but later struck out against him once again. Vanessa, ever the loyal wife but tainted by her husband's bleak world, executed her traitorous son in Daredevil vol. 2 #31 (2002). Other criminals rose to power when the Kingpin was unseated in the early 1990s, but through cunning and intransigence Fisk regained his underworld stature by the end of the decade. The twentyfirst century has provided Fisk with new challenges, including blindness induced by a gunshot to the face and the ascendancy of Daredevil himself as the new Kingpin. By 2005, however, Fisk had begun to claw his way back to supremacy—but where else would one expect to find the Kingpin? As a testament to the power of writer Lee and artist Romita's original vision of the character, Kingpin appears virtually unaltered in the pages of Ultimate Spider-Man (2001–present), Marvel's reimagining of the web-slinger's mythos. Kingpin has appeared in television animation on the 1967, 1981, 1994, and 2003 incarnations of Spider-Man and on Spider-Woman (1979–1980). John Rhys-Davies played Fisk in the 1989 live-action TV movie The Trial of the Incredible Hulk, while Michael Clarke Duncan portrayed him in the 2003 film Daredevil. Several Kingpin action figures and collectible figurines were produced in the 1990s and 2000s. The pin for articulation between an automobile stub axle and an axle-beam or steering head. Also known as swivel pin.